The buildings radiated a persona like no other. Standing tall in the desert and numbering over 6,000 houses, 103 mosques, and 14 hammans of architectural wonder, they stood out and showed brilliance in a time when such buildings were one of a kind. And the structures stand today in one of the longest occupied cities in the world. 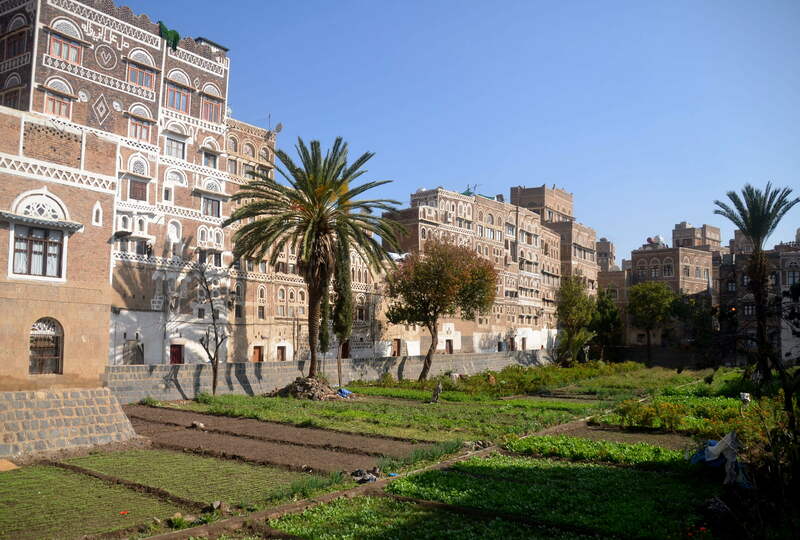 Constructed of ochre-colored rammed earth and burnt bricks on stone foundations and decorated with white gypsum, the 5-9 storied buildings exist today in the ancient city of Sanaa, Yemen, like a Manhattan in the Desert. 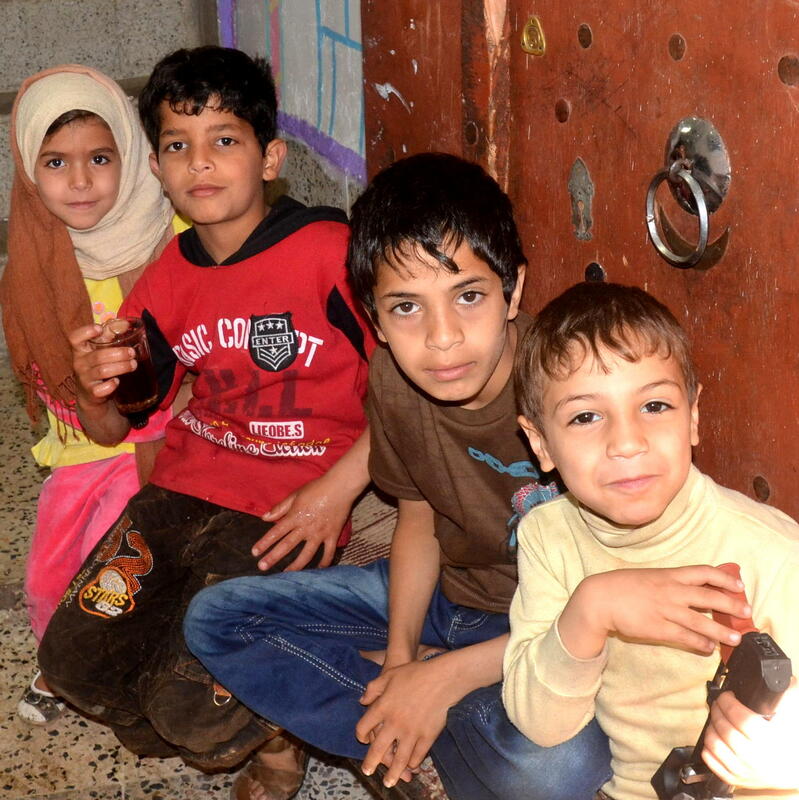 They have endured 2500 years of earthquakes and everything else that has come along. 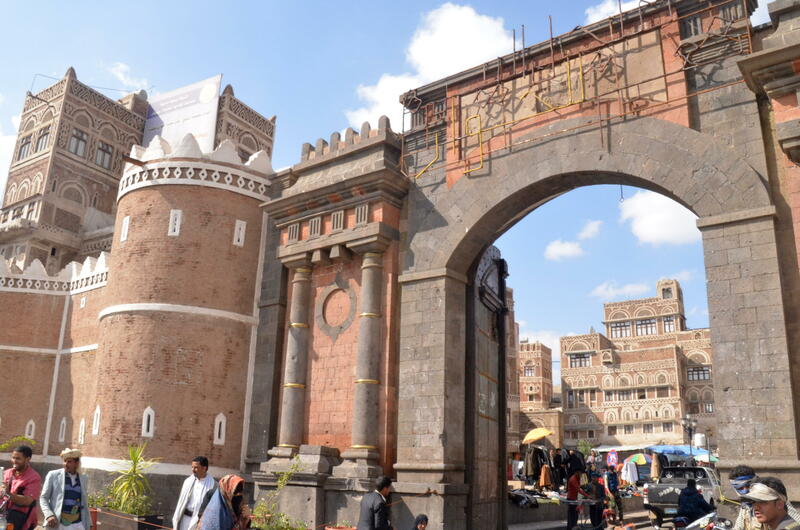 Surrounded by a 45-foot tall wall, the only entrance gate remaining into the city is Bab al Yemen. Many people, products and animals have passed through that gate and it still reigns as the only entrance into the one of a kind city. The other 5 original gates were destroyed. 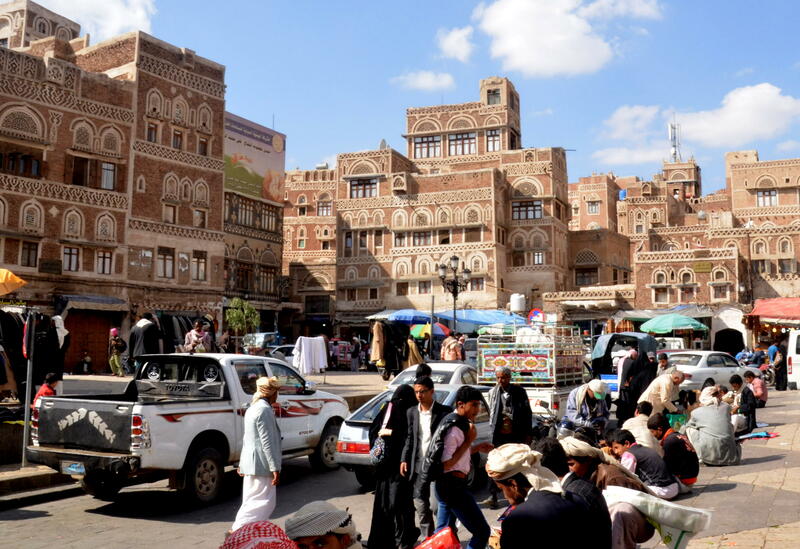 The Sana’a old city is an UNESCO World Heritage site. 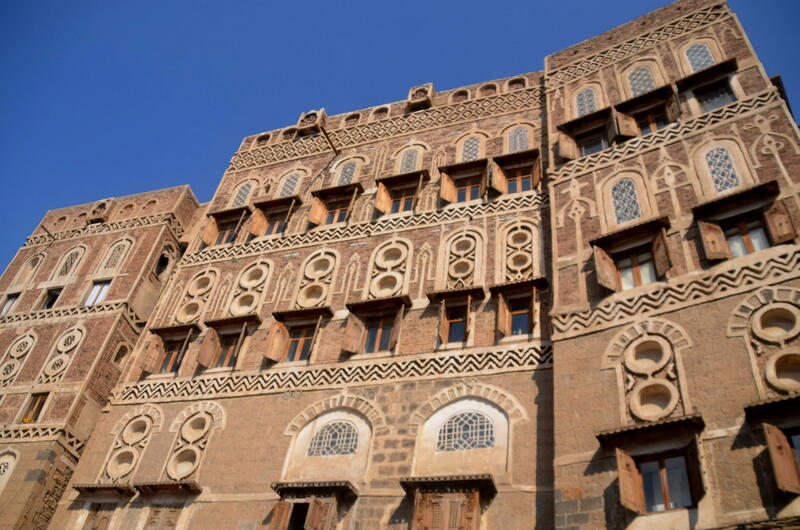 It was this outstanding architecture that endured me as we entered the city to go to the Suq el Yemen market through the city. Just walking through the market was an adventure back in time and an experience to remember forever. 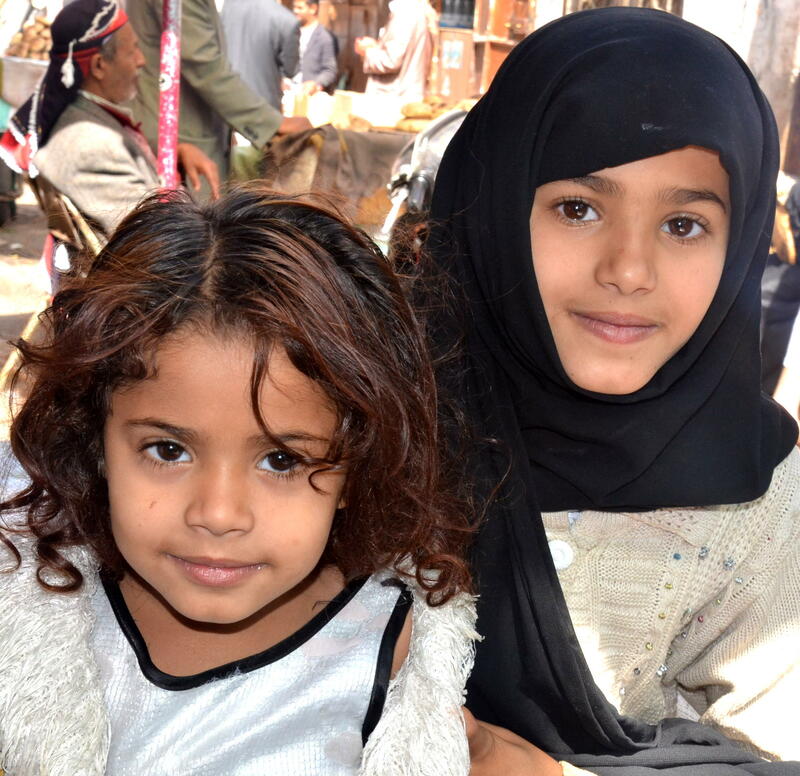 First to greet us were the children living in the old city. Running to the windows to see us and running out the doors into the streets to wave was a such wonderful greeting. Blowing kisses to the children, saying how we love then and waving “Hello” and saying how we love their awesome city made for a happy experience for all of us. And it continued as we strolled further into the market. First, the men, each wearing a dagger called jambeya, gathered to find out where we were from and when they found out, told us they loved us and we told them the same and greeted them. Then 2 ladies totally covered in black from head to toe except for their eyes asked about the latest research and danger of cell phones held to long to the ear. 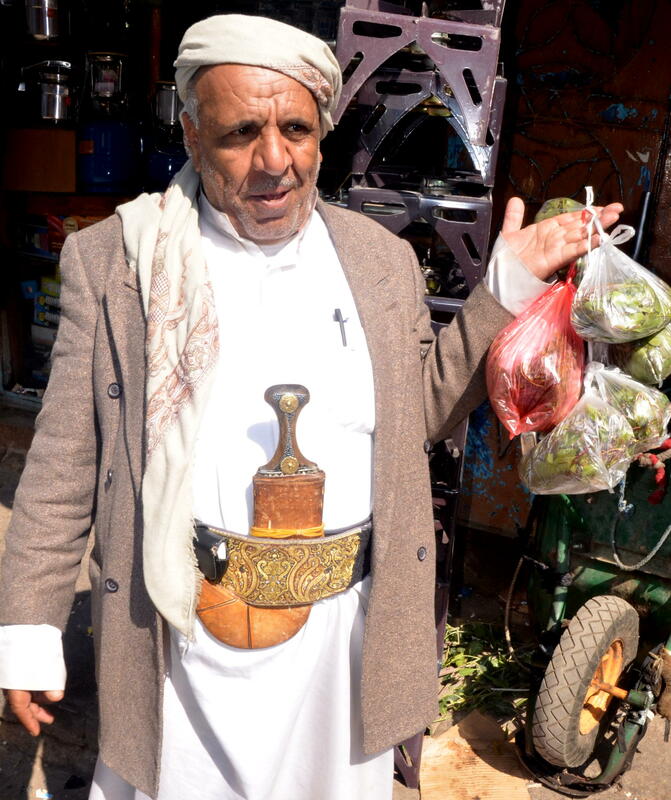 He just purchased several bags of Khat to chew. Proceeding through the market, we came across the bakers just baking rolls one after the other. We wondered what the rolls tasted like because they smelled so good. 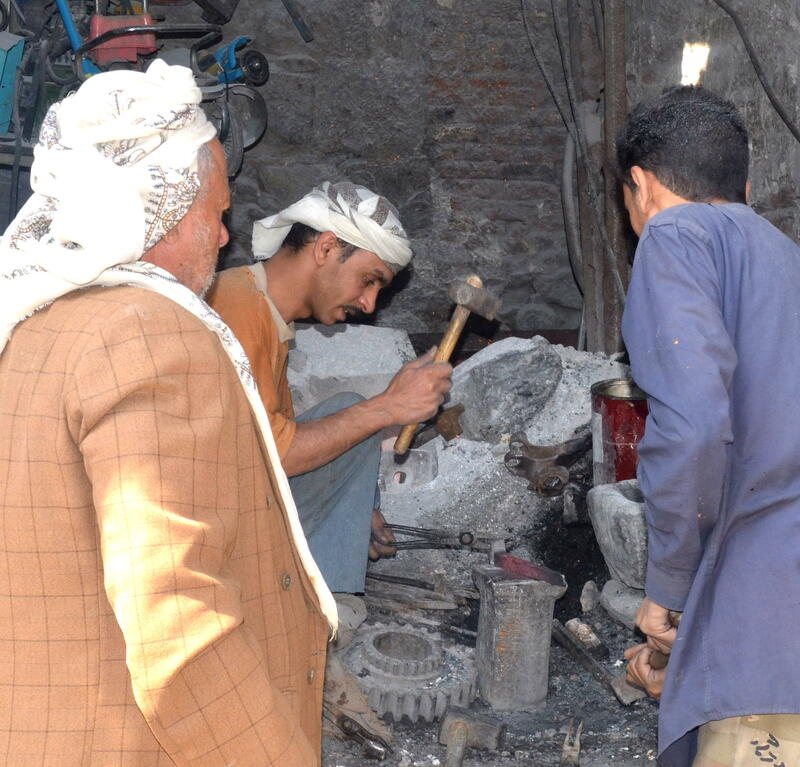 Then it was the metal worker in his little 6×6 foot (2×2 meters) shop making door knockers and hinges for customers. 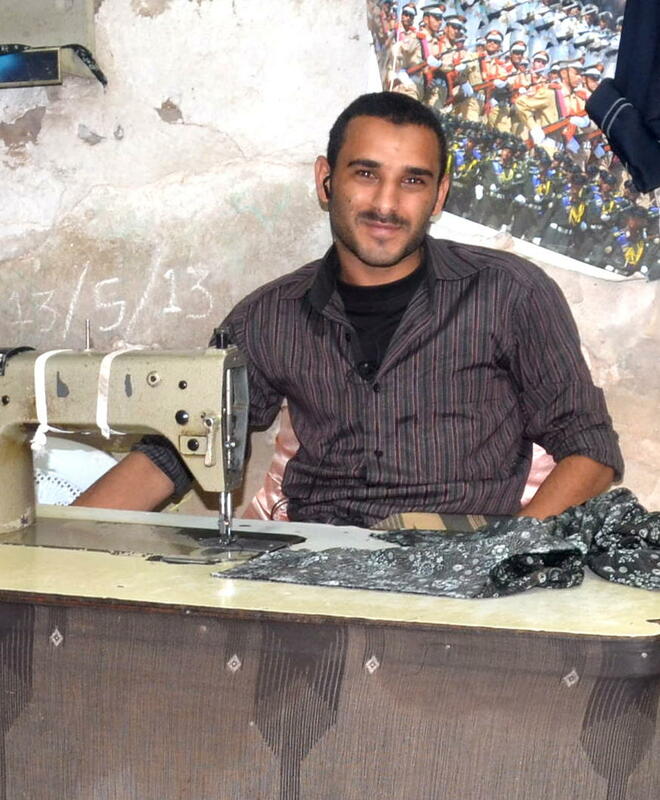 Next, we found the seamster making new clothing and repairing the old. 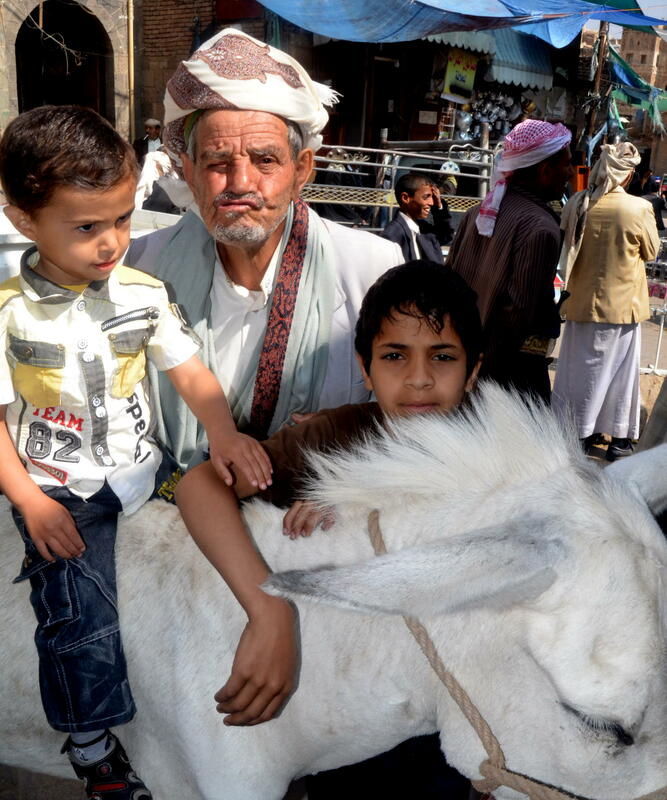 Pretty soon, it was the donkey market, where owners brought their donkeys, young and old, to sell. 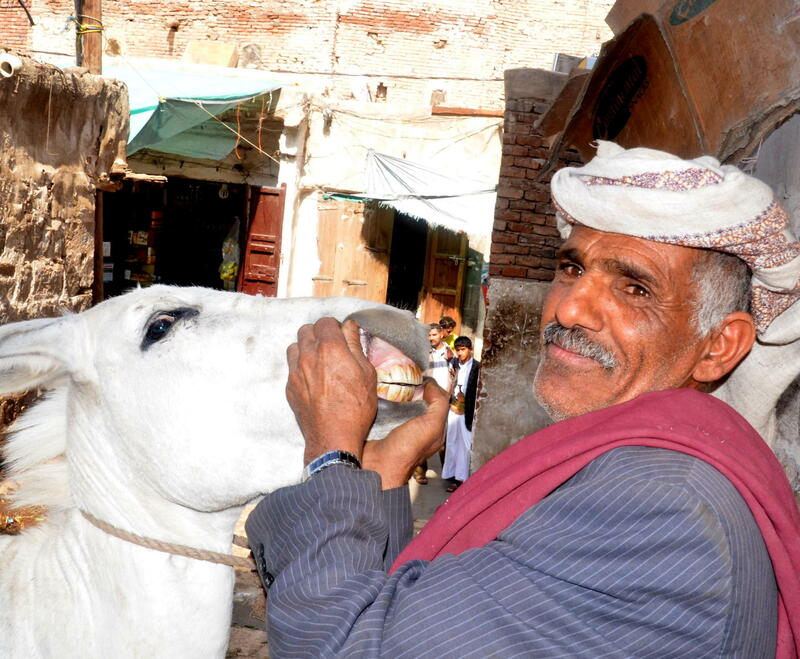 One owner told us a donkey with all teeth was young, one with a little space between teeth was older and one with a lot of space between the teeth was old. 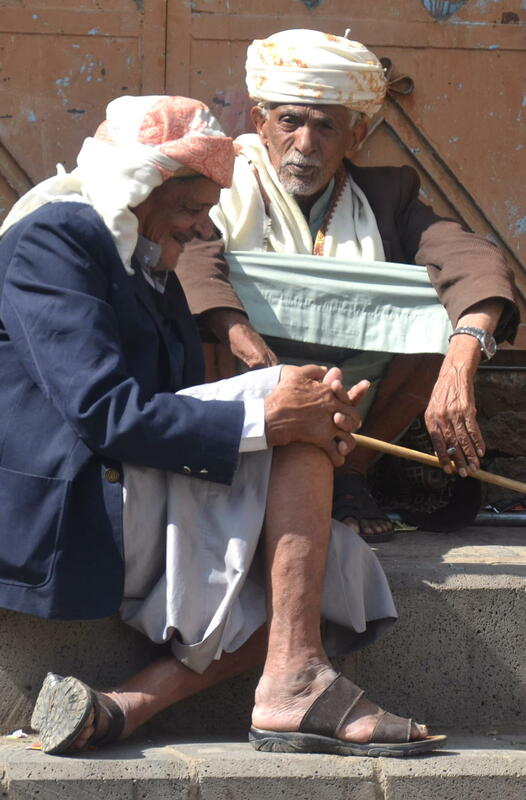 Along the way, we saw these 2 older men heavy in conversation and we wondered what they were discussing. Dagger salesmen were everywhere. 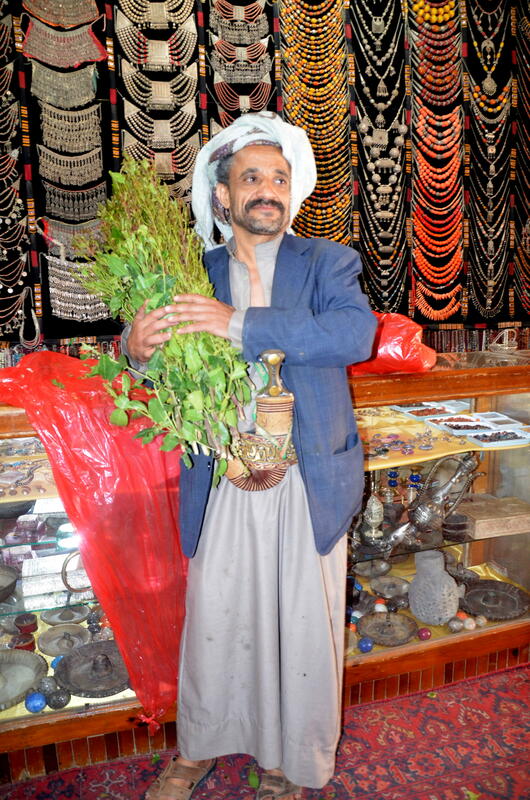 As we entered a shop to admire all the gorgeous silver daggers, and semi-precious decorated ones, a peddler came in selling khat (cot). 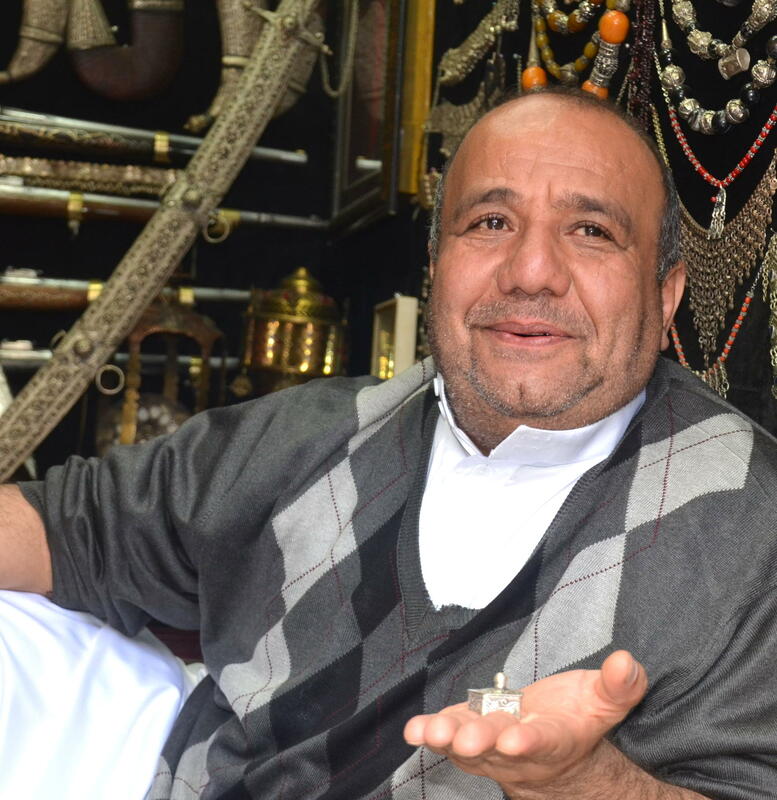 One vendor in his 4×4 foot shop greeted us, we told him where we are from and that we loved his classic city and the people in it and then he gave each one of us a little silver box as a gift from him and as a remembrance of Sana’a Yemen. 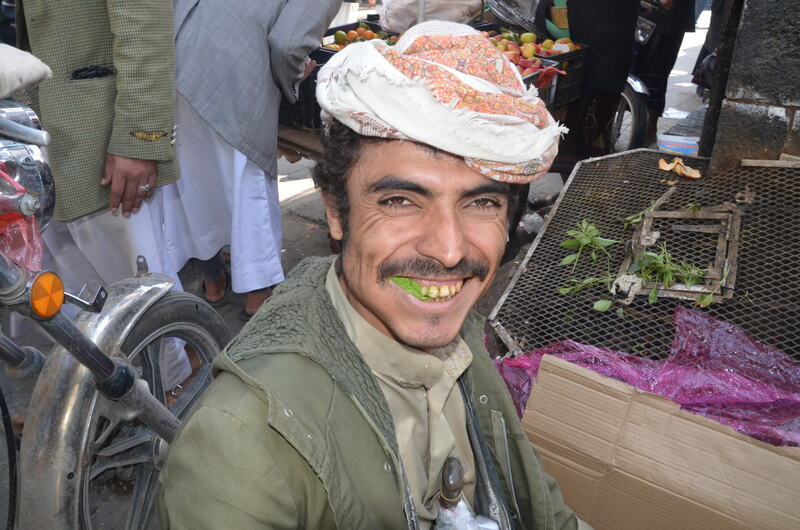 Wondering what the big bulge was in every man’s cheek as we continued through the market, we learned that it was khat, an evergreen leafy tree that produces a stimulant and causes euphoria and excitement. 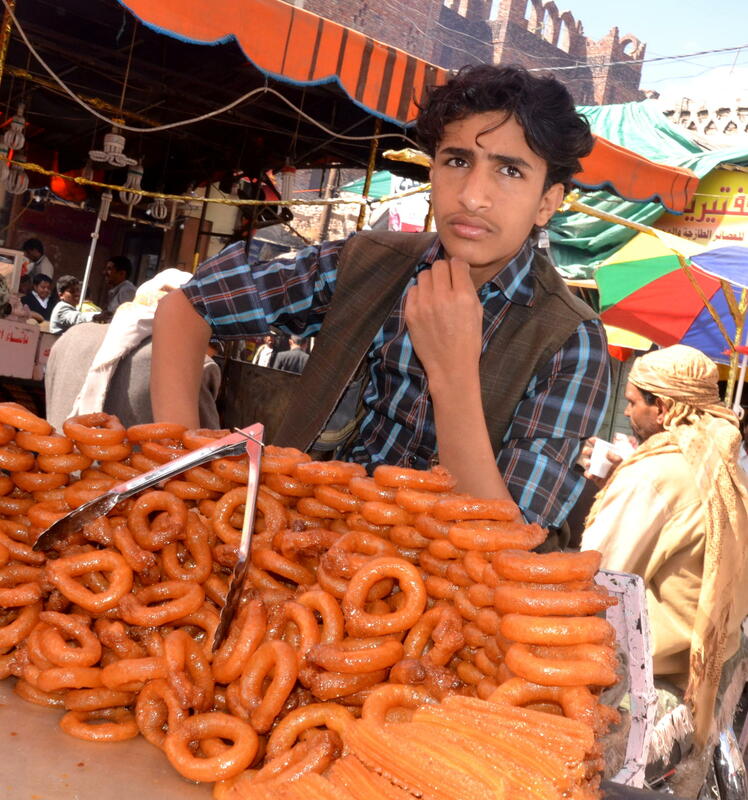 Legal to chew in Yemen, it has been around for thousands of years. 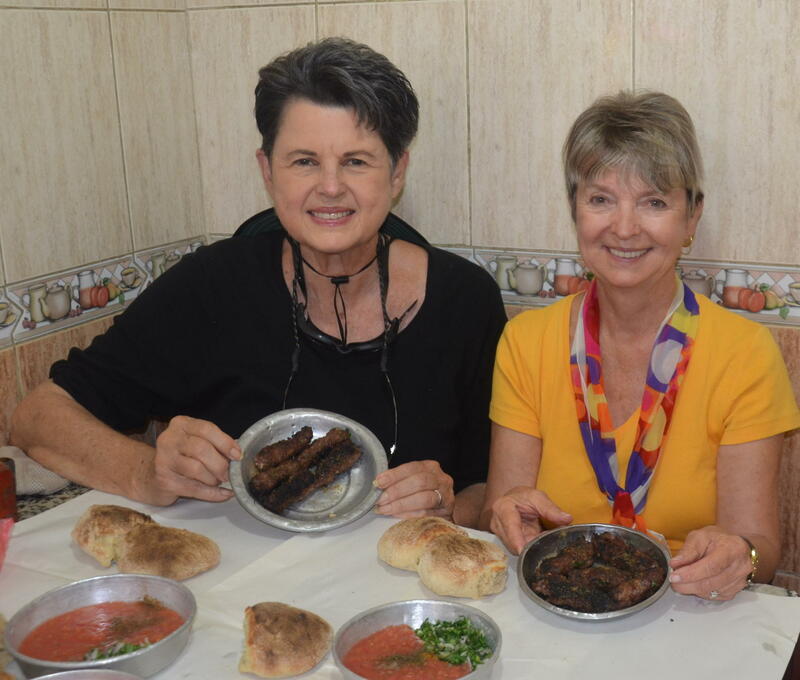 Now it was time for lunch and our guide, Mounir, took us to Fawaz Kabab Restaurant, a 6×12 foot (2×4 meter) restaurant that had 4 tables for customers. The kabobs were grilled on the street in front of the restaurant and were delicious. Remember those rolls that the bakers were making, well, we put a delicious tomato relish on them and several other tasty little vegetables and they were wonderful. Mounir told us every customer that he took to this restaurant loved the food and atmosphere. But we were not finished yet because we had to end with fresh brewed tea across the street. And as we sipped our hot tea, market shoppers walked by, greeted us and several even said they loved our country as it had been spread all over the market by then where we were from. Men with their daggers strapped to them, children wanting their photos taken “so we could make them a TV star” and ladies in their black robes walked by and greeted us. 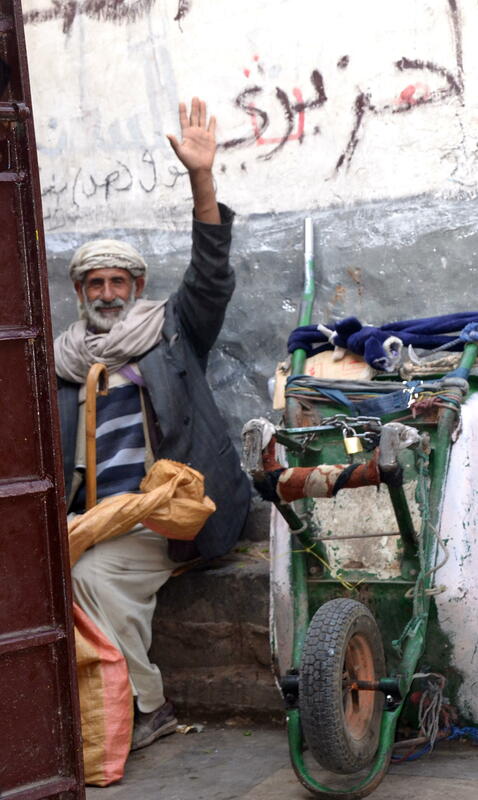 Next, we passed the rope sellers and the date seller. 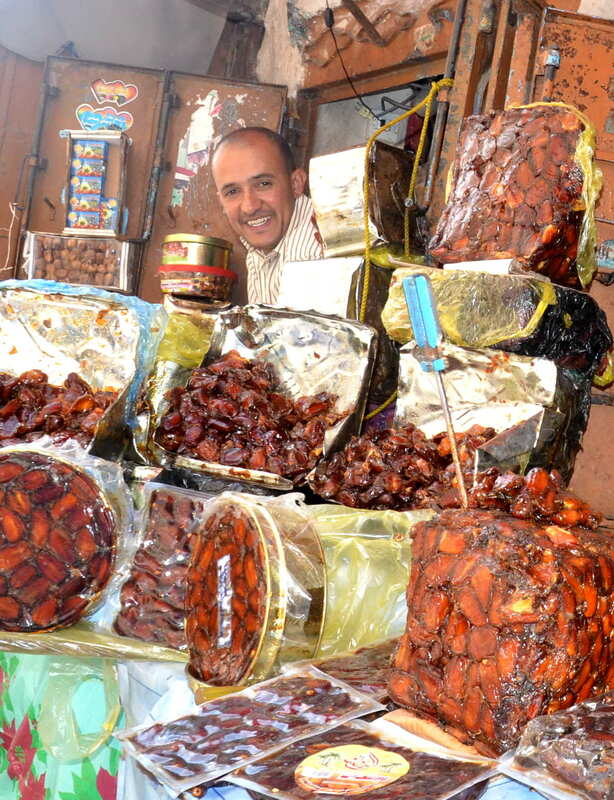 He had every type of date for sale that must have existed in the world and he constantly swatted the bees who wanted a tasty snack. The donut man was watching for them also. Business at noon had been pretty good as he had sold half of his donuts on the tray. 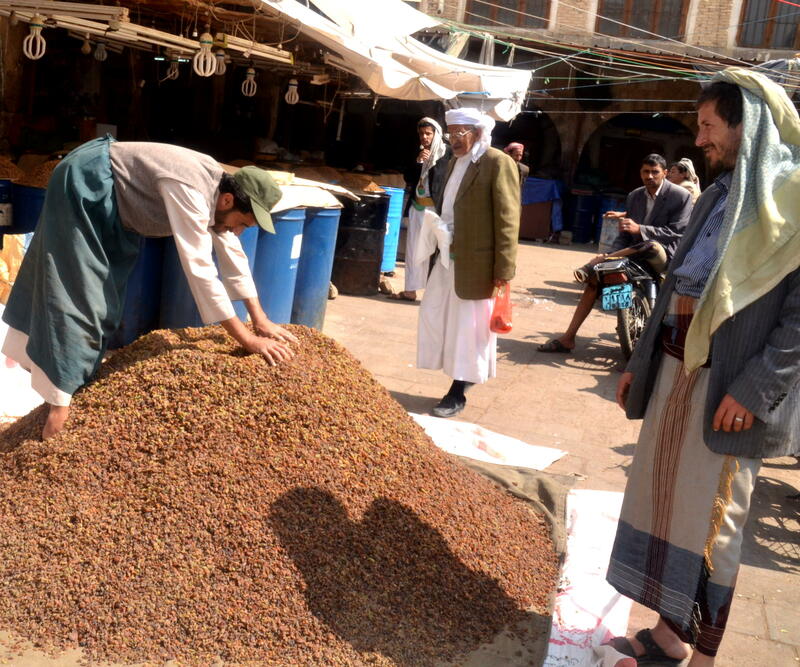 We preceded to an open area surrounded by stalls or shops and every one of them sold raisins. Raisins were everywhere and they had so many, they poured them in a pile out in the open and one man was standing on top of the pile but we couldn’t understand what he was doing. I had never seen so many raisins in my life. It must have been harvest time all over the world. 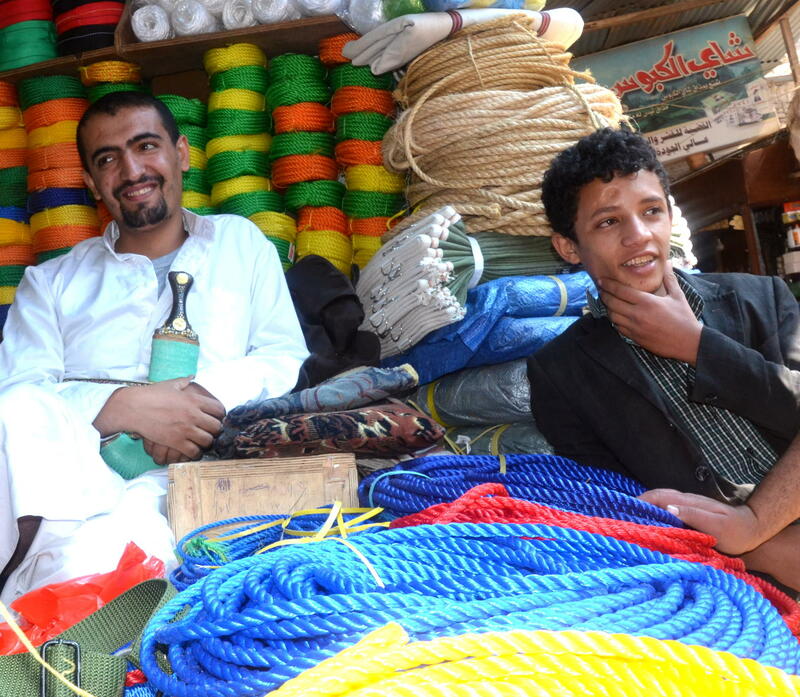 We then proceeded to the garment area where t-shirts, shorts, beautiful scarves, fabrics and dresses were being sold. We just loved these beautiful ornate ensembles complete with headdress. 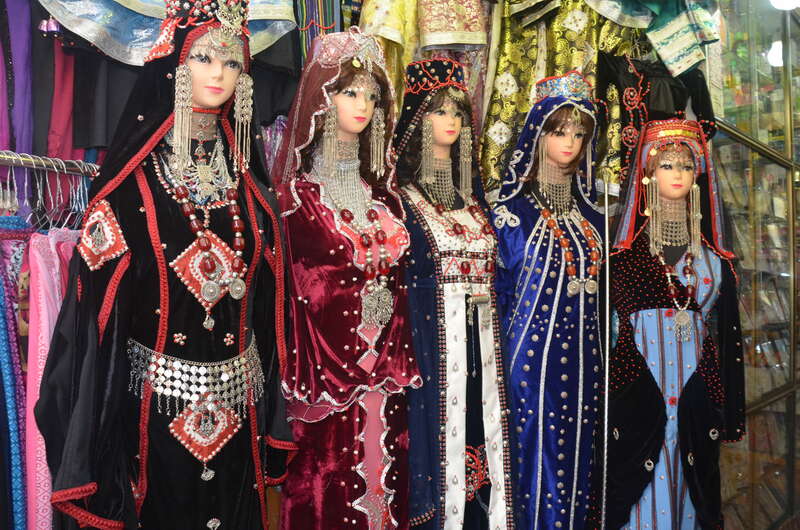 We had seen these on ladies who had performed in the area. They were so beautiful. 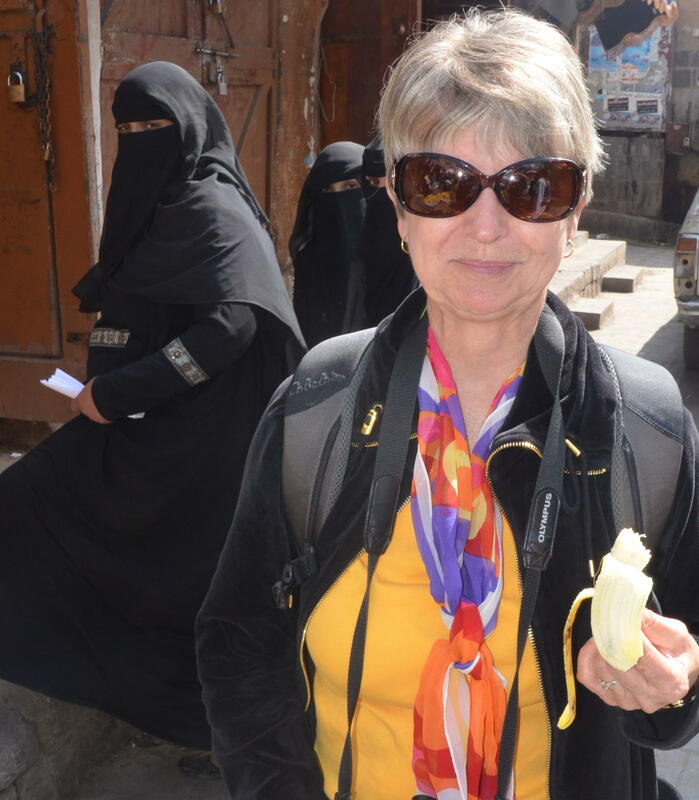 Vendors gave us bananas and June was still sampling hers as the photo was made. Too soon, it was time to bid the priceless old market goodbye. And as we left, we greeted several old men and children sitting on the curb wanting us to take their photo or wondering why we were taking their photo. 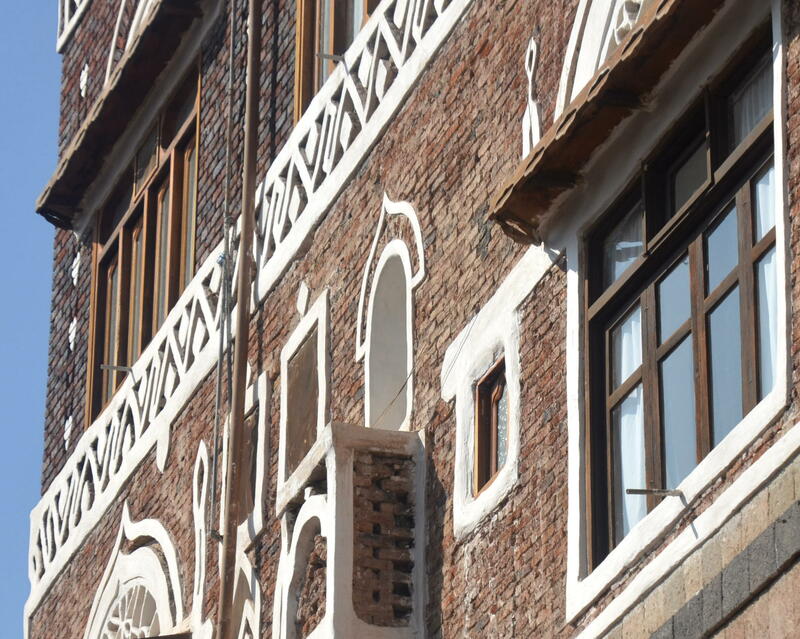 The market has continued day in and day out for 2,500 years and the magnificent, distinctive buildings still stand majestically, just like a Manhattan in the Desert. The middle section between the palm tree and the other tree NO LONG EXIST after a bomb destroyed it in June 2015. The gingerbread mud houses are now back to the dirt after hundreds of years. The Old City is an UNESCO site.